As I was thinking about the holidays and what I love so much about them, I remembered the holiday smells that use to waft through my friend’s house. Only the fragrant smells were not from good ole’ home cooking, but from a few common ingredients found in the pantry and around the garden. A little Knott’s boysenberry syrup, a couple of cinnamon sticks, little white flowers from an orange tree, a few cloves, and a bit of water stirred in a pot turned my friend’s house into a holiday abode. 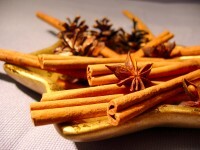 Homemade Simmering Potpourri is a great, frugal way to make the house smell delicious. For some more ideas, try these great recipes. Directions: To make homemade simmering potpourri fill a small saucepan with the ingredients and simmer over low on the stove or use an electric potpourri simmering pot . Make sure to keep an eye on the water levels and refill as necessary. Simple and great smelling. I like to mix the dry ingredients up in little Ziploc’s to have them ready to add to water during the holiday season. Mix all ingredients in medium saucepan. Simmer on low heat. Add more water as needed. Add a little apple cider to your simmering water, and you get a whole new flavor. This entry was posted in Simple Living and tagged homemade simmering potpourri on 2009-11-24 by Christine.